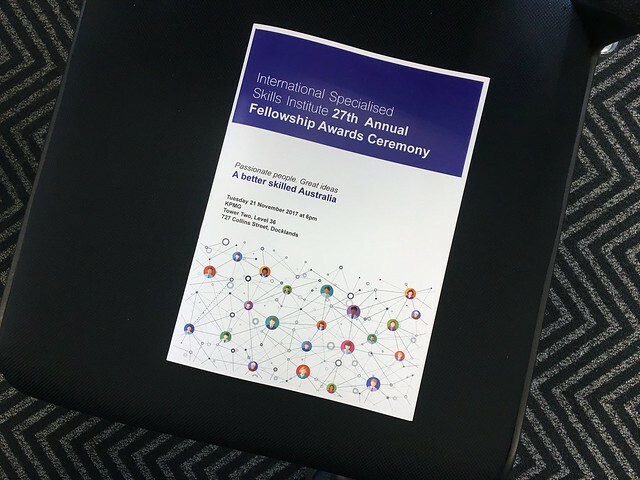 My last night in Melbourne was partly spent on the dramatic 37th floor view of the city from the KPMG building, this being a special evening to honor the International Specialised Skills Institute Fellowship Awards Ceremony. I should add that this is their 27th year of awarding this fellowships, and still, few colleagues I met in Australia, in Victoria, even know about the ISSI. This makes them in a way a bit like the MacArthur Fellow awards. In times when programs to support fellowships are landing by the roadside, this program is remarkable for its support of such things for people in parts of education (TAFES) and specialized trades who normally would never have access to sources to send them overseas for professional development. Among the awardees were winemakers, construction specialists, a carver of wooden carousel horses, an antique locksmith, a designer of go karts, and more. In preparing for this topic as broad and open as that skyline view, I decided the last thing I wanted to do was to talk to slides. 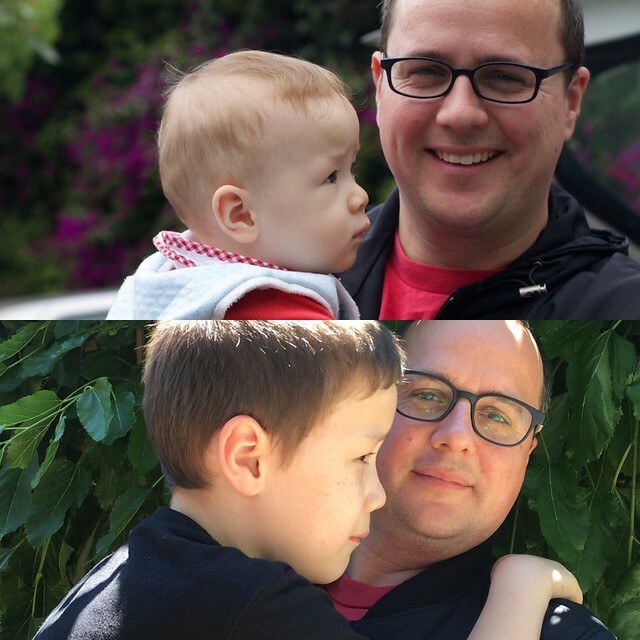 Somewhat inspired by Martha Burtis’s keynote at the Domains 17 conference I decided to set up a rotating series of quickly changing photos to be in the background, more as a back drop. I suggested they were random but had a meaning. In lieu of manually downloading, and editing a video, I remembered some command line scripts the generous and kind John Johnston had shared (this is a hint, and John’s photo is in the mix) to create a video from flickr. In trying out his scripts, and sharing via twitter, as sure as the possibility of castles in Scotland, John shared an updated version of his scripts. I changed his slightly for a flickr API call to pull photos from a set. Mine came out reversed form the order in flickr, so I would recommend reversing your intended order, if it strictly matters. Maybe I ended up fiddling with the images and video a bit more than writing my remarks, but as it goes. Doing so always makes me think broadly about the topic. For tomorrow's remarks at a fancy dinner event, I'm going unconventionally (for me) slideless AND writing out thoughts ahead of time. Madness. Yes, I wrote out my remarks in a Google Doc, and as much as I prefer being loose and speaking from the hip, it actually worked for this talk. And better yet, I ended up writing the rest of this blog post. So here it goes, with links and media added post. I admit I did use load the document on my phone to have as a reference. People seemed to appreciate the storytelling approach. Should that be of any surprise? Thank you International Specialised Skills Institute for this evening. In lieu of using a slide deck, I have playing in the background a looping video of random photos. It’s just a backdrop; I will come back to them later. I also thank the Institute for inviting me to here from the United States as a visiting fellow. It’s been a rewarding opportunity to meet people so committed to learning through the TAFEs, Adult Education programs, and other less traditional learning environments. And such high energy, enthusiastic people. As you know things are rather… odd… in my country, so it is refreshing to be in a place where the spirit of human care for all people is genuine. A few weeks ago I was in the “queue” (notice I did not say “line”) to board the long flight from Los Angeles to Melbourne. There were two different groups of travelers behind me, rather obviously Aussie, who started chatting. Soon the volume and excitement of their conversation peaked as they figured out they were very closely connected. It’s an Aussie thing to do so joyfully, but it’s also a human thing, to crave the magic of serendipity. That’s what I crave in my work/life experiences. I have an advantage over tonight’s announced new fellows in that I’m almost at the end of my experience. I have some suggestions for you to consider in your journeys, but like all free advice, take it or leave it. But what I will say, and what it means for your professional experience, and what it mean for others, comes from my own lived stories. For someone who studied physical sciences, a change in form suggests a phase change, or a structural one, that of a new internal arrangement. And change in appearance to, for a person, is likely at that skin depth level (like me buying dress clothes). It’s the change in nature I find most interesting, and to me, the most powerful. Almost exactly ten years ago I had another fellowship opportunity here in Oz, through the national Flexible Learning Leaders Framework. I had only two weeks available to visit for presentations and workshops in 8 different cities. I was told they could plan it. And oh did they! My first bit of advice is to not to plan such an aggressive schedule. Give yourself time in places to do more than work. Create and make personal space for yourself. Soak in as much of the different culture and experience as you can. Walk a lot. And if you can, try to go to places where tourists don’t go. Take photos. Take notes. Build memories. My trip in 2007 was built upon connections made earlier, through collaboration via the crude internet of the 1990s. I spent two months here on my own sabbatical from the Maricopa Community Colleges in 2000, details made possible via Australian colleagues I met through their visits to Maricopa, as well as online conferences, listservs, and email. 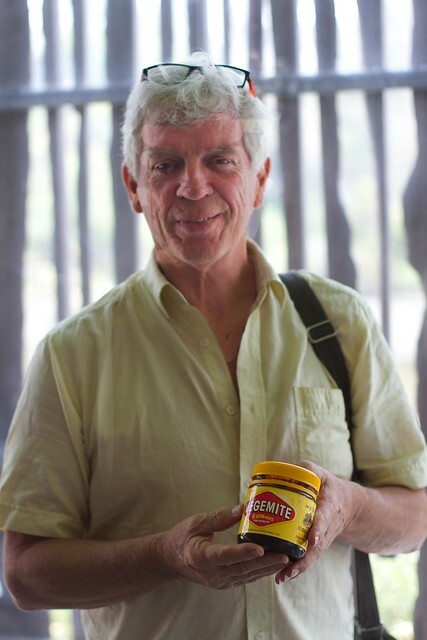 On my first stop in Canberra I stayed at the home of CIT faculty Allan Moore, who took me out to see my first kangaroos and a scenic trip to Batemans’s Bay. Seventeen years I still cross paths with “Big Al” on twitter. @allanmoore what's hopping over in Canberra, b'ig Al? I also got to know well Michael Coghlan from Adelaide TAFE; over the years we have shared our enjoyment of music and photography, regularly commenting on each other’s flickr photos. Michael even flew out here to visit a few days on this trip and we got to do a photowalk together. This collegiality is not insignificant. And this past Sunday I visited the home of my friend Rowan, the last time we saw each other 2011 when his son was an infant and his daughter not yet in this world. Rowan and I met as participants in an open online digital storytelling community. Alex wanted to pose with his Dad in a reenactment of the photo I took then. It seems not all that remarkable that such things happen online, yet here I am in his home, as a friend, playing games with his kids. This too, is not insignificant. When you go abroad for your fellowship, naturally your priority is completing the learning goal of your project. But also try to gain as much cultural experience and human connections as you can cultivate. Find people who share interests and ideas. The connections made and the stories you can tell, much more than project reports and published papers, will be the things that have a much longer more significant impact on you are a person. I don’t remember names, places, and dates very well, especially ones from 17 years ago. But I do not need to as in 2000 I published the details, people, and photos on my own web site; it was a blog made of hand coded HTML, before blog software existed. I also outsourced memory to photos in flickr, so I can find where I was, with who on almost any date back to 2004. Plus I have my own written record of projects, ideas, thoughts as an open notebook on the blog I did start in 2003. This is a practice I spoke of in my “Show Your Work!” workshops, one a colleague describes as “narrating our work”. Not for readers or followers or building audience (well my Mom was a regular reader) but just for me as as a way of “thinking out loud”. Writing helps me work out, refine ideas. If anything I have done has maybe had an impact, it was this practice, which was at a peak in the 2000s but has tailed off for others in the last few years with the rise of social media platforms. I still blog and upload photos regularly. And I can assert that my presence here, my professional network of colleagues and friends, people I have gotten to know via online interactions, and many whom I have gotten to visit in their homes — all of stems from this practice sharing in my own digital spaces. I can say I have traveled to places like Iceland, New Zealand, Scotland, Mexico, because of this. I’ve had colleagues visit me in my home from all over the US, Canada, the U.K., The Netherlands. In 2009 I started building a web site collection of contributed video “Amazing Stories of Open Sharing”, small, unexpected, serendipity stories, positive connective experiences that happened as a consequence of openly sharing something online. 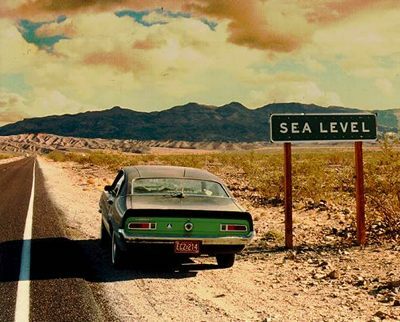 For example in 1988, before I was even in the education field, I took a photo of my car in Death Valley parked next to a sign that read “Sea Level”. For some reason, when I started building web content in 1992, I scanned the print, and put it on my web server as a file named “sea-level.jpg”. Years later I got an email from someone in Germany I did not know, requesting permission to use the photo. 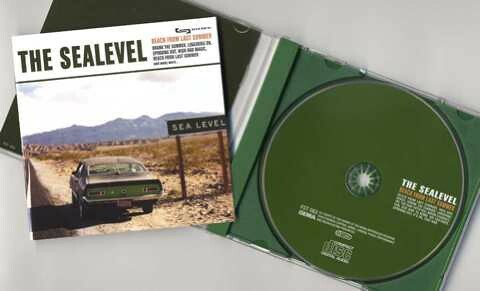 He was in a band called “The Sea Level” and they had searched the web, found my photo, and wanted to use it as a cover image on their CD. I do not take photos to earn money, so I emailed him a digital copy of the photo, and a few weeks later I got a CD in the mail, from Germany, with my photo on a disc of pop beach music from a German band. I smile when ever one of their songs comes up in my music shuffle. Those kind of experiences as small, not directly related to education or technology, but they are almost magical. They have significance. They transform and suggest there is great potential in the networks. It’s been my goal to create as much potential possibility for online serendipity as I can. Good things come from it, if only for a brief positive exchange with someone far away that you would not have connected with otherwise. That is what’s in those photos flashing behind me, I picked just under 300 from almost 60,000 I have posted in flickr, that represent people, places, and things I have gotten to do because I chose to not lock up my content, charge for it, but to just let it flow out there. My urge to you, in planning your trip abroad, is to think about the ways you might share and openly document it, both for others, but more importantly, for yourself. In the middle of it, the experiences will be vivid, but with time details will fuzz and fade away. Many of you will naturally do this through social media, in Facebook, twitter. Instagram. That’s important for sharing your moments. But while easy to use, those platforms are problematic; they are designed primarily for the moment. They are stored in someone else’s archive, and your actions are also part of a system of data harvest and sale to advertisers. So yes, post and share some out in social media, but I suggest creating your own digital memory, in a place you manage and control. It could be a blog, it could be a photo sharing site, it could be Google Images. But do more than store photos in files, title, caption them, and keep a journal. And then, when you get back, do what you can to share your experience in both the stories you tell, and the ones you publish and share. I cannot guarantee you will have amazing stories of bands from Germany requesting to use your photo or offers to speak in Iceland. Rewards like that should be happy bonuses, not an expectation. You do not need to share the way I did, but whatever you can do to build and maintain the human connections, to do the storytelling of your experience, that is what will be a bigger long term pay off for you professionally and personally. If it were not true, I’d not be standing here tonight.